As any radio or TV producer will tell you, finding the right contributor for your programme is often the easiest part of their job. Arranging the logistics can be the biggest challenge – especially when your contributor lives in another part of the world. Independent radio producer Mark Burrows was able to secure an interview with film director Mick Jackson who lives in Los Angeles for a forthcoming BBC Radio Sheffield documentary. Traditionally this would involve sourcing and booking an ISDN equipped studio and engineer – and all associated costs. Instead, Burrows contacted In:Quality having recently heard about their internet based streaming technology ipDTL. Using the ‘ipDTL Network’ – an online map-based directory of ipDTL users, they were able to easily pinpoint potential candidates. Voice Artist Howard Cogan lives in the same neighbourhood as Jackson and agreed to facilitate the interview in his home studio – connecting to Burrows’ studio in Nottingham, UK. 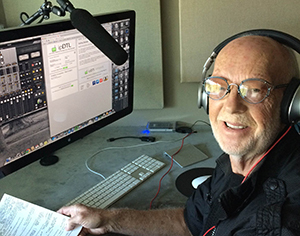 In his day job, Howard is the voice of radio stations such as Jack FM and ABC’s hit sitcom Modern Family and uses ipDTL to connect to his clients in studio quality. Mark Burrows is producing a radio special for BBC Radio Sheffield to commemorate the 30th anniversary of the nuclear holocaust film “Threads” (which was set and filmed in Sheffield) for broadcast on Radio Sheffield later this year. In:Quality is a Manchester (UK) based startup headed by former BBC sound engineer Kevin Leach. It seeks to provide live broadcast facilities for TV & radio programmes using new internet technology. ipDTL has been developed by In:Quality and is being adopted by radio stations, voice talent and producers around the world as a cost-effective alternative to ISDN.